Trick or treat? 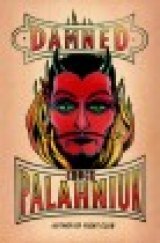 With Chuck Palahniuk's "Damned" (Doubleday, 256 pages, $24.95) it's a treat. Just in time for Halloween, Palahniuk ("Fight Club," "Rant," "Choke") takes his readers on a tour of Hell as experienced by 13-year-old Madison Spencer, the smart, sharp-tongued daughter of a movie star known for traveling the world and adopting children and a billionaire investor. Madison dies of an apparent drug overdose in a luxury hotel suite while watching her mother host the Oscars and ends up in a Hell that combines the torments imagined by Dante along with elements of the John Hughes film "The Breakfast Club." Madison is obviously a John Hughes fan, including the "Home Alone" flicks, because that's often been her fate -- left to her own devices while her parents wander the world in search of new children to adopt. She was even left behind over the Christmas holidays at the Swiss boarding school she attends. "The Breakfast Club," where students of Shermer High spend detention together, is how Madison deals with Hell. She recalls arriving in the infernal regions in a Lincoln Town Car, driven by a man -- she thinks it's a man -- who welcomes her to his vehicle with a sign labeled MADISON SPENCER in all caps. Once in Hell, she's assigned a cell and soon meets her fellow recent arrivals -- a cheerleader, a nerd, a jock and a punk rocker. She quickly discovers Hell is a lot like a movie theater littered knee deep with popcorn balls, sticky gum and candy, as well as a place where there's a Dandruff Desert and a Mountain of Toenail Clippings. Madison, who has serious self-esteem issues -- particularly her weight -- begins a trek with Babette, the cheerleader, Leonard, the nerd, Patterson, the football player, and Archer, the punk rocker to beard the devil in his den. Madison wants to get out of Hell, but first she's putting in time in a call center. And you -- silly you -- thought call centers were located in Belize, India, or West Virginia. Palahniuk's sweltering call centers are in Hell and they time their calls to interrupt your dinner hour. Hell indeed is other people, as Jean-Paul Sartre imagined it in his play usually translated in English as "No Exit." The original French title of the existentialist play, first performed in May 1944, just before the liberation of Paris, is "Huis Clos," the French equivalent of the legal term "in camera," referring to a private session behind closed doors. In "Huis Clos," Sartre depicts Hell as a place where three characters are punished by being locked in a room together for eternity and is the source of Sartre's most famous quotation, l'enfer, c'est les autres ("Hell is other people"). "Damned" also reminded me of Thomas Pynchon's novel "Inherent Vice", especially in its social commentary and joyous readability. (For my Sept. 17, 2009 review of "Inherent Vice", click on: http://archives.huntingtonnews.net/columns/090917-kinchen-columnsbookreview.html). I called Pynchon's work an "entertainment," using a phrase employed by English novelist Graham Greene, and I'm placing "Damned" in the same category. But categories are flexible and you'll get more than just entertainment -- not that that's a bad thing -- out of "Damned." Each chapter begins with a plea from the narrator -- "Are you there, Satan? It's me, Madison." I found myself looking forward to her adventures in Hell and I'm guessing most readers will, too. Before he became a bestselling author, Chuck Palahniuk, born in 1962 and a 1986 journalism graduate of the University of Oregon, worked on the Portland, OR assembly line of the truck manufacturer Freightliner. He ended up writing their training manuals before writing "Fight Club," published in 1996. He lives near Portland, and spends time in his native state of Washington, near Seattle. His website is: www.chuckpalahniuk.net.